UPDATE – Please note that from the 16 June 2017 this document will no longer be accepted by the Department of Agriculture and Water Resources. Please see our resources page for the correct wording for the packing declaration. Today we’re taking a good look at one of the more important documents that is required for customs clearance on all sea freight shipments that arrive into Australia. The Packing Declaration. Starting from the top, the document MUST be placed on the packers/suppliers letterhead. It must also show the companies name and address. Vessel name / voyage number, consignment/numerical link must be on the document to allow this form to linked to your shipment. All of the self explanatory questions must be answered. 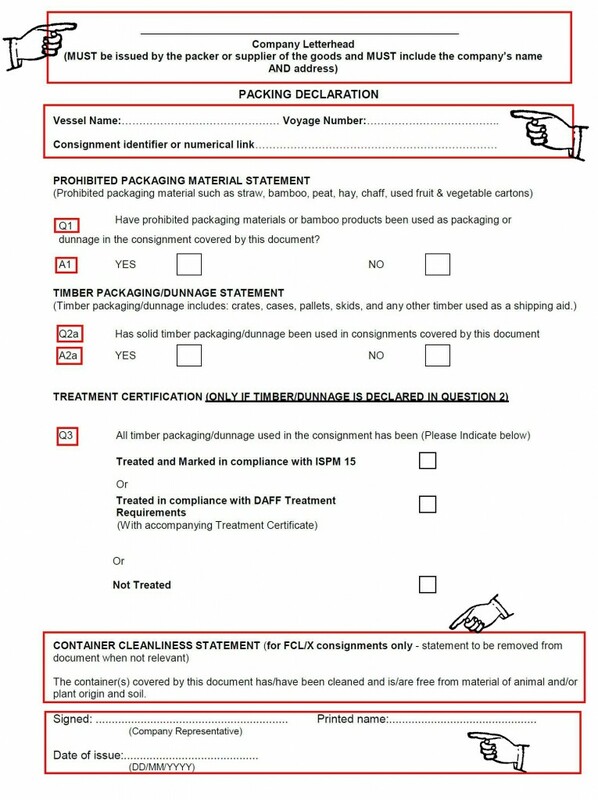 Container cleanliness statement – can be removed for LCL shipments. The shipper/ packer must sign, print name and date the document the day that the shipment was packed. You can download your copy of the packing declaration here in pdf format, or head to our resources page for a doc version. If you have any questions regarding packing declarations, please contact us directly. Packing declarations are not required for air freight shipments into Australia.